I cut up some onions, carrots, and garlic, and put them in a deep baking dish. Then I rubbed the chicken (it was about 4 lbs.) with olive oil, sprinkled it with salt and pepper, and inserted small pieces of garlic in between the skin and the meat. I roasted the chicken for 15 minutes at 450 degrees, then turned the temperature down to 375 degrees and baked it for an hour more. At that point it was nice and brown but the meat near the bones was still a little pink, so I put a lid on the baking dish and baked the chicken and veggies for 20 more minutes covered at 375. We make coffee in a French press, so I sewed up a little cozy to keep the coffee warm a little longer. I cut different coffee cup shapes out of red ticking, used fusible web to adhere them to a 7" x 12" piece of linen. Then I hand appliqued them and embroidered some little details on them. I sewed that to 2 layers of batting and a 9" x 14" piece of red backing fabric. Then I folded the backing over the edges to bind the linen. I sewed on 4 red buttons and 4 elastic loops to close the cozy around the french press. I think it turned out pretty well for my first time, but I should have made it just a little bit longer, maybe 1/2". And I should have attached the batting and backing to the linen before I embroidered the cups so the embroidery stitches would be quilting stitches too. Also the binding turned out a little bit funny, so I should have just used binding strips, I think the backing fabric I used was a little too thick to be a good binding fabric. I wanted to make a new fall wreath, but all the wreath ideas I pinned on Pinterest weren't quite right. I wanted something simple, but still cute. I bought a styrofoam wreath form, the striped fabric, and some brown linen at Joann fabric's during their Labor Day sale. After playing around with a lot of different ideas I settled on wrapping the wreath form with the striped fabric and making rosettes out of the linen to add a special touch. I love the way it turned out! Before I post my menu plan, I just have to say this. I have never liked Greek yogurt. I have had so many friends rave about it's creamy goodness, and have tried several different brands, but I always felt something was missing, it just didn't taste right to me. Then, I tried Trader Joe's full-fat Greek yogurt (plain, with a little bit of sugar and frozen pineapple mixed in for flavor) and it is out of this world good! This is not an ad for Trader Joe's (even though I do think it is an amazing store :) but a recommendation to try full-fat Greek yogurt. Most stores only sell low-fat or fat-free Greek yogurt, so you'll have to do a little hunting, but it is worth it! I only buy full-fat dairy products for our family. Saturated fat is an important part of a balanced diet. It helps maintain cell structure and stabilize blood sugar, as well as making things taste great! (I am not advocating eating a lot of greasy fried foods from fast food restaurants or using hydrogenated oils. Naturally occurring fat is nothing to be afraid of, but a lot of the oils and butter substitutes that are available have been modified in labs so they don't resemble what our bodies were designed to digest.) Milk has cream for a reason, and I think that removing the cream (flavor!) from dairy products and adding a lot of sugar, stabilizers, and artificial flavors to make them look and taste better results in an inferior product. Yesterday Titus, Caleb, and I went strawberry picking with some friends. The weather was beautiful, and there were plenty of berries to pick. I brought home about 12 pounds of strawberries and a few stalks of rhubarb. I froze some of the strawberries for smoothies. To keep them from freezing into a giant clump I flash froze them. I lined a cookie sheet with waxed paper, hulled and halved the strawberries, and spread them out on the cookie sheet, which I put in the freezer for about an hour (sorry I don't have a picture of that). 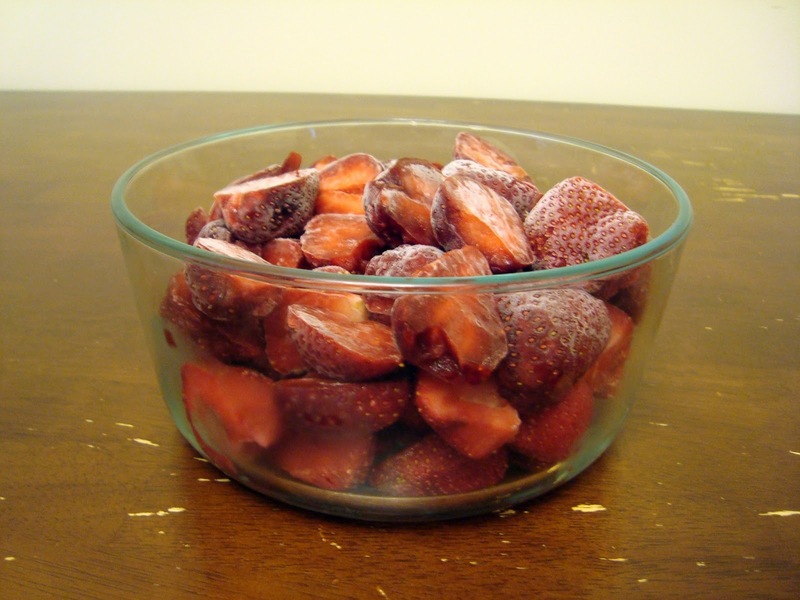 Once the strawberries were frozen, I quickly removed them from the cookie sheet and transferred them, still frozen, to an airtight container and put them back in the freezer. To make the crust, combine the flour and salt. Cut in the shortening with a pastry cutter until it is all incorporated, but is still a little crumbly. Add water a little bit at a time until the mixture just starts to come together. Stir very gently, over-handling the crust makes it tough instead of flaky. Divide crust pastry into 2 balls and roll one out and put in a pie plate to form the bottom crust. 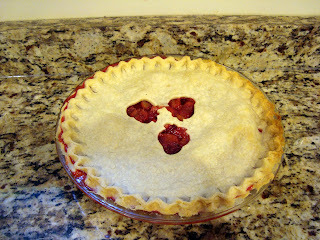 Roll the other ball of pie crust and use for the top crust after the filling is in. To make the filling, combine the flour, sugar, and salt. Pour this over the stawberries and rhubarb and gently mix until combined. Let this sit for about 10-15 min. Spoon the filling into the pan lined pie pan (there will be a lot of strawberry-rhubarb "syrup" left over, don't put this in, just save it for topping pancakes, ice cream, etc.) Lay the top crust on top of the pie. Trim the extra crust off and crimp the edges of the pie crust together. Use a fork or knife to make a few vents in the top crust to let out the steam. Bake for 10 minutes, then reduce oven temperature to 350 degrees F and bake for 30-40 minutes until the crust is starting to brown and the filling is bubbling. 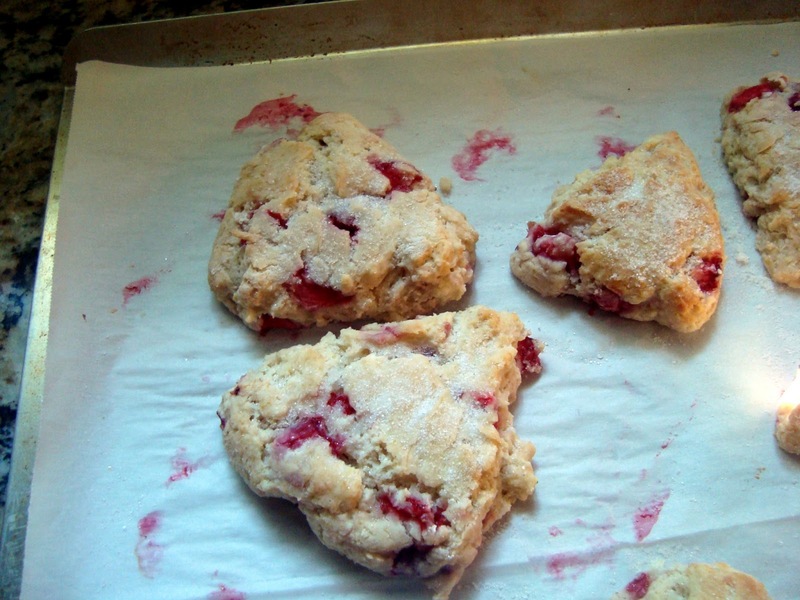 This morning I made strawberry scones using this recipe. Strawberry picking was so much fun and we are definitely enjoying the fruits of our labor! I am a wife, a mom, a baker, a crafter, a homemaker, and, most importantly, a believer in God.